Organic Oven is proof positive that relatives can make good business partners. “In high school, I always liked helping out with recipes, but it’s really (my mom’s) baby,” says co-owner Precious Yutangco. Yutangco helps run the business alongside her mother Peachy, a chemical engineer who was up to the challenge of eliminating sugar, eggs and flour from her oven for the baked goods-depraved. “When she was a stay-at-home mom, she’d sell what she baked with the neighbours,” said Yutangco. This was during Yutangco’s childhood in the Philippines. She and Peachy immigrated to Canada in 1995, leaving behind her mom’s abusive husband. The pair opened the first Organic Oven in 2002 in Brampton. Their latest location is steps away from Lawrence station. Yutangco balances the business while taking fourth year summer courses at York University for mass communications and writing for the Toronto Star. She believes in the product. Like its name suggests, Organic Oven carries a variety of baked goods catered to those with specific food allergies or in need of sugar-free products. There’s also a cafe that is all fair trade. 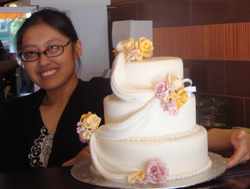 Organic Oven Bakery and Café is located at 3189 Yonge St. 416-489-7777.